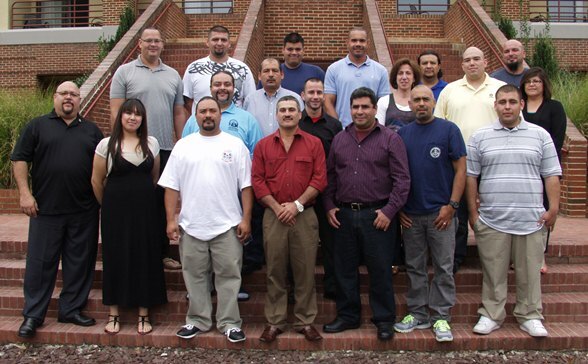 The Spanish Leadership II class from the week of September 16 learned important techniques in collective bargaining, steward training, organizing and lobbying. The Spanish Working Group at the William W. Winpisinger Education and Technology Center recently began a week of intense training in Spanish Leadership II with a group of Spanish-speaking members from IAM Locals across the country. As with the English Leadership II Program, classes included Collective Bargaining II, Advanced Steward Training II, Why Organizing Matters, Labor History II, and Issues and Lobbying II. The class on Issues and Lobbying takes advantage of the Winpisinger Center’s close proximity to the Nation’s Capital. Participants learned about the lobbying process and went to Capitol Hill to lobby their members of Congress. Issues affecting working families such as immigration, airline mergers, health care, Social Security and trade deals were studied in depth to ensure the participants had a successful lobby session. Lobby simulations were setup in the classroom prior to the visit to Capitol Hill so that participants would be at ease during their actual appointments. A long way from his job at Boeing in Everett, WA, Adrian Camez, an IAM Steward at Local 751A, strongly supports the IAM Spanish Leadership program and hopes that more members can take advantage of this opportunity to refine their Spanish labor lingo to reach out to the 11 million immigrants who hold the key to the growth of the labor force. “This Spanish program allows me to become a bridge to my fellow Latino workers who don’t speak English and need guidance on worker rights and the rights to organize,” said Camez, who spoke to his representative about the currently held-up immigration reform. With so many classes going on throughout the day, the Spanish Leadership II program demands a lot of each and every student. Students are grouped into “lodges” and work on projects as a team. A hands-on approach to real work-site issues are played out in mock scenarios and situations. The students are given the tools necessary to develop their methods for solving problems. In the end the students learn from each other, as well. Recently-retired Western Territory Grand Lodge Representative Joel Ochoa, who has been teaching the Spanish Labor Studies at Winpisinger since its inception, said the program gives Spanish-speaking members the same structured labor studies education as their English-speaking counterparts. There are still openings for the November 10, 2013 Spanish Advanced Leadership Program. The class is open to any Spanish-speaking IAM member, with local lodge approval, who has previously completed either the Spanish or English Leadership II Program. Enrollment forms are available here in Spanish and here in English. If you have any questions about the Spanish Leadership Programs or need any additional information, please contact Ruth Lowery at (301) 373-3300 or email rlowery@iamaw.org.